The time has come for everyone to start calling Floyd Mayweather Jr. out. The public has been waiting years for this fight to happen. Mayweather has always said he would fight Pacquiao on his own terms. Well, Floyd was officially called out by Pacquiao on a national platform. Manny Pacquiao was on ESPN’s First Take a few years ago promoting his bout with Juan Manuel Marquez. He was asked if he was OK with taking all performance enhancing test and a smaller purse in order to fight Floyd. These were the terms required by Mayweather in order to make the fight happen with Pacquiao. Since Pacquiao has made it known that he would do whatever it took to get the bout against Mayweather there has been one statement from Floyd’s camp. That statement came from his manager Leonard Ellerby. He basically stated “Floyd dictates his own terms with his fights”. In my opinion, this was a sign of stalling or ducking. Floyd is trying to maintain his Sugar Ray Robinson status as one of the best all-around boxers without a blemish on his record. Ray Robinson finished his professional career with a 128-1-2 record. Floyd is currently 46-0 and he definitely wants to keep it that way. I believe Floyd knows how dangerous Pacquiao could have been inside the ring. 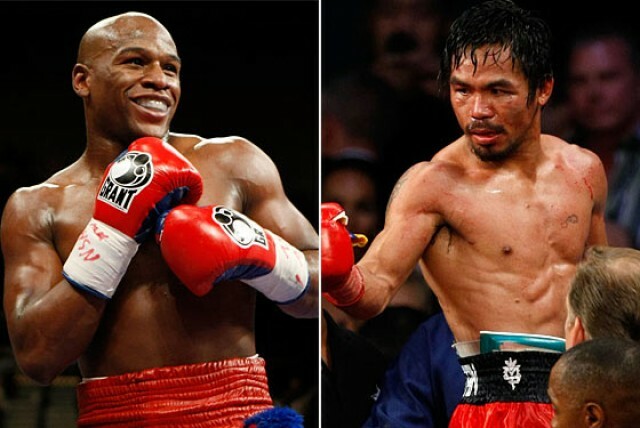 Unfortunately, Pacquiao’s knockout lost the Marquez literally took the luster off a matchup with Mayweather. Floyd has never fought an opponent that had a combination of speed, power, and tenacity. Manny Pacquiao exhibited all the traits that made him a giant risk to Mayweather’s perfect record. I agree with all the analysts who believe Mayweather is the best defensive fighter pound for pound. In my opinion, the younger unblemished Manny would have landed punches because he would be un-afraid to take the fight to Mayweather. I believe we would have seen Mayweather truly get hit for the first time in his career.